Did arcade monitors have same pixel aspect ratio as TV sets? It is well known that when emulating classic games on modern displays, you need to be careful not to distort the aspect ratio. Generally speaking, CRT screens were 4:3, and specific pixel aspect ratios of many classic arcade games, consoles and computers are given here. Of course, title safe area was a concern, particularly for home computers that had to work on many different models of TV sets. It's hard to say exactly what was the title safe area for NTSC TV, but the Commodore 64 is generally accepted as having come pretty close to it. From the above table, 320 pixels / 8.19 MHz = 39 microseconds, which sounds in the right ballpark. NES: 256 pixels / 5.37 MHz = 47.6 microseconds. That is significantly past the title safe area and into overscan, but that's fine, that was a feature for a dedicated console; it matches one's memory of playing Super Mario Brothers, where objects would scroll onto the right of the screen without any visible border. ... unless. That's an arcade machine. It came with its own screen. Sure, TV picture tube minus the tuner, 4:3 overall aspect ratio. But maybe they could have tweaked the display electronics to shrink the horizontal scan, so more of that 51.2 microsecond active scan line is visible. But in that case, the calculated pixel aspect ratio of 27:22 would be no longer valid. And in general, it would be harder to figure out exactly what was the pixel aspect ratio of arcade machines. Calculating it from the pixel clock in the same way as for home computers and consoles would no longer give quite the correct results. Is the above conjecture correct? Or did arcade machines actually use the same parameters as TV sets, and did Missile Command just accept some extra wasted pixels? CRTs don't have pixels, they don't work that way. Also, arcade monitors expose all the picture controls at the back so it is possible to adjust them quite extensively. Operators would have made sure that the picture was the right shape and in focus near the edges. Since the controls are all analogue and no-one bothered to measure the display geometry the aspect ratio was just close to 4:3, basically whatever looked good to whoever set it up. The picture controls adjust the width of the beam scanning area, for example, so the pixel clock is irrelevant. The owner just turns the knob until the picture covers most of the screen. Games were designed with this in mind and the horizontal resolution was just that - resolution, not an attempt to create a particular aspect ratio. 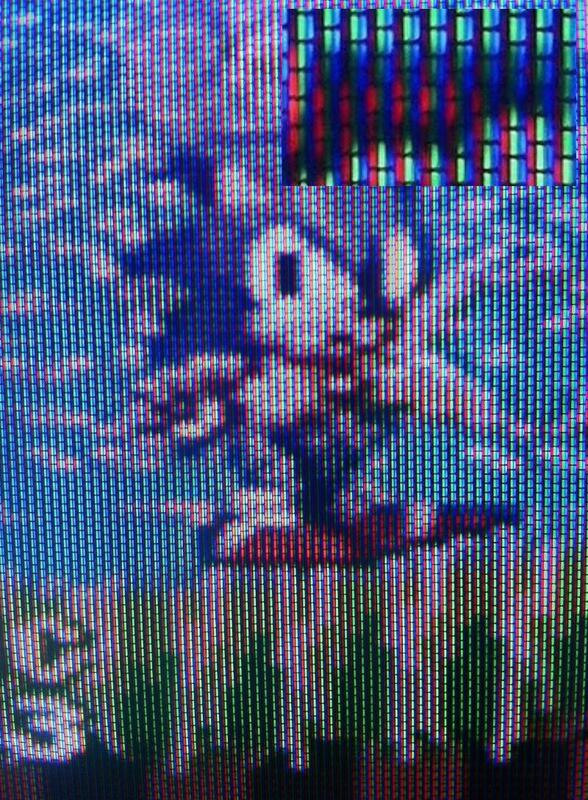 with thanks to Tommy, here is an image from an actual CRT. In the upper right there is a zoomed in area from Sonic's foot, which shows some of the vertical bars that people often assume are pixels are in fact not evenly lit. The tops and bottoms of some of them are at different brightness levels. The bars you can see are actually the shadow mask, and are unrelated to pixels. They define the maximum horizontal resolution that the CRT is capable of resolving, but even then the relationship is not 1:1. Short answer: No, not necessarily. To start with, 'Title Safe Area' is an idea to define the parts of one transmission to be displayed even if any of the many receivers is maladjusted. It's nothing inherent to the TV signal or its definition, it's a safeguard against less than correct receivers. Next, Pixel ratio is, even on a TV, complete arbitrary. TV sets a frame timing, but not a pixel one. The number frames per second and number of lines within a frame is defined by the respective standard, but that's it. The number of pixels per line is, even on TV, infinite. Of course, as they get defined 'tighter', as more restrictions due transmission and electronics appear. It's up to the application what restrictions are acceptable or not. In general, colour resolution on TV is less than luminescence resolution. When it comes to the tube, none of these standards set any numbers. While they are made to fit certain standards, a CRT offers complete freedom, not only for pixels per line (as in TV) but also for number of lines per frame and frames per second - as long as it's within the CRTs abilities. Parameters are set here mostly by screen mask (for colour games) resolution, phosphor used and electronics used for deflection. As a result, even by using standard CRTs and average electronics resolution and pixel ratio can diverge quite from what a TV supports - and in both cases Pixel resolution is arbitrary due the fact that signals are analogue and not bound to any standard. Asteroids is an example of an arcade cabinet that didn’t even use raster graphics, but vector graphics. Battlezone and Lunar Lander were others. They used similar technology to the Tektronix 4000-series terminals of the ’70s, or the IBM 2250: A cathode ray fired into the back of a glass screen coated with phosphors, like in an old-fashioned black-and-white TV, but instead of moving across each row of the stream in a regular pattern and switching on and off, it instead followed a more complex path to draw geometric line art. Not the answer you're looking for? Browse other questions tagged hardware display arcade ntsc or ask your own question. What computers had redefinable character sets? Why not one pixel per color clock? Did any pre-microprocessor CPUs have a clock near the toggle speed of the logic ICs used? Did DEC build their early computers out of the same parts? Why did the original Apple //e have two sets of inverse video characters? Why did the Cray-1 have 8 parity bits per word? When did hardware antialiasing start being available?